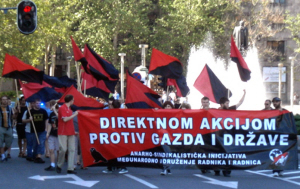 On this day, ten years ago, on October 19th 2002, the founding Congress of the Anarcho-Syndicalist Initiative was held in Belgrade. In previous ten years ASI has intensively supported the organizing of revolutionary libertarian workers' movement. Apart from direct participation in workers' and student strikes and protests, we are regularly publishing our weekly bulletin “Direktna akcija” (Direct Action) and sustain active publishing activities. This year, as it has for the past eight years, our publishing-research body — Center for Libertarian Studies (CLS) will be participating in The Belgrade Bookfare with the intention to make the theory and history of the workers' movement accessible to people, as well as to confront commercialization of culture, and support spreading and strengthening of progressive thought and radical social critique. In June 2010 we have again filed for registration of Anarcho-Syndicalist Initiative as a union organization, but because of the bureaucratic obstructions of the state this process is still ongoing. Since it's founding ASI has actively participated in the international workers' movement, and in 2004 it became a Section of The International Workers Association (AIT–IWA). We can all feel on our own skin what the social conditions are like. Record breaking unemployment, minimal wages and spiraling rise of prices on one side, and unbelievably lavish life style of bosses and politicians on the other, is a picture of present day Serbia and the world. Because of this we are not inviting the workers to an anniversary party, but calling them to an organized class struggle! This struggle can not relay on yellow unions and political parties. It has to be without intermediaries, based on direct action against the interests of the bosses and the state, and direct-democratic — based on assembly decision making, without bureaucrats and unrecallable delegates, because only through such kind of struggle can fundamental improvements of the position of the workers be made, and foundations for a truly free society can be laid. We continue the struggle today, the struggle which we have started 10 years ago, with the same zeal. It is a struggle for the improvement of the working class position, for the creation of workers' movement based on the principles of direct action and direct democracy, and a struggle for revolutionary transformation of society — which means getting rid of capitalism and state. We call all those without rights, workers, students, unemployed and pensioners to join us in this struggle, for a life worthy of a human being. For stateless self-managed communism. For anarchy!